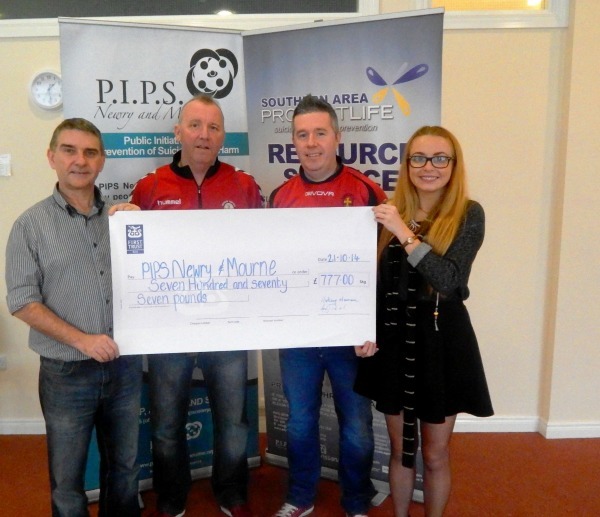 In a bid to raise money for PIPS Newry and Mourne and their football club, the managers of Midway United under 7’s and the senior team played for 12 hours straight on the 6TH September 2014. Along with all the matches taking place at Whitegate Community 5-aside pitch, Anthony McDonnell one of the organisers arranged lots of other activities for the day such as amusements, giant board games, refreshments such as burgers and pop-corn stands and this all proved a massive hit with the little ones. Anthony would like to take this time and thank all the sponsors for and on the day such as McDonalds, Cycle Recycle, Newry Credit Union, McEvoys, Supervalue, The Meadow and Armagh Road Community Association and Today’s Local, Whitegates. All the managers would like to give a great thank you to everybody who helped out in the event, all the players and everybody who attended and supported the event for PIPS Newry and Mourne, something close to a lot of Meadow Residents hearts. PIPS Newry and Mourne are touched by the money donated by the community and are very appreciative for all the effort everyone went through and to Anthony McDonnell as he’s been running about in and out of the office getting things organised. Altogether, £1,553.92 was raised before and during the event of which £777 was donated to our charity. A very special thank-you to Anthony and every single organiser involved.